Flashing, shimmering, rattling, whirring, and buzzing all around us: life seems unthinkable without all the small and large machines that accompany our everyday routines; for each task there is a specially designed device. Herds of machines populate the Earth, connected to one another and permeating our lives and activities. Whether they move, assemble products, make calculations, think, or fight—all have been programmed, automated, and authorized by us. Who influences whom? Do machines influence humans—or vice versa? How will the technosphere change us, and how will the biosphere change in the Anthropocene? These questions are typical of the Anthropocene. The mechanical duck developed by the engineer Jacques de Vaucanson at the end of the eighteenth century was a milestone in robotics. This duck contained hundreds of movable parts and thus was able to move its wings, to drink and—due to a chemical reaction—to digest food. The Syntelmann was constructed in 1973. Courtesy of the Deutsches Museum. Large eyes, clunky feet, and a stylish scarf around his neck: this was the “Maschinen-Mensch” MM8, a creation of the Viennese designer Claus Scholz-Nauendorf in the 1960s, a machine that brought humanity one step closer to fulfilling the dreams of a useful artificial human being. He could shake hands and pour drinks but had difficulty walking. The energy supply was quite costly, which is why this robot did not gain wide acceptance. The Syntelmann, also on display in this exhibition, was a human-operated exoskeleton that could be controlled from a distance in order to perform tasks in environments too hazardous for humans, such as the deep sea, outer space, or nuclear power plants. Movements were transmitted electronically from the “master,” a human-operated exoskeleton controller, to the mechanical manipulator (the “slave”) up to 100 meters away; the electromotive joints of the manipulator copied the movements of the human controller. However, robots are not able to copy a human’s ability to make decisions and act spontaneously. 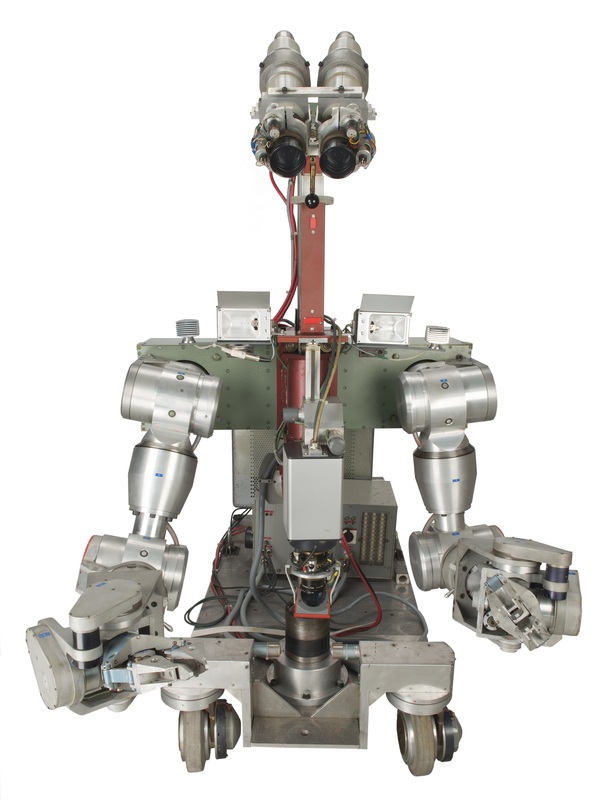 Robots were initially used in the cleanup of the nuclear reactor in Fukushima, destroyed in 2011. However, the unpredictable conditions and degree of rubble were beyond the robot’s abilities. Instead, 25,000 human workers had to clean up the ruined nuclear reactor. Even before the era of science fiction movies, humans were fascinated by the idea of creating artificial intelligence. Hardly any other technical device has changed the world as drastically as the computer. The digitally based, electronically run machines can be custom programmed to meet individual needs: writing, making calculations, drawing, planning, or running simulations; they handle tasks of a complexity that we once could only have imagined. From the minicomputer that runs our washing machines to the supercomputers used for climate or medical research—life without digital computers has become unthinkable. Ever faster, more powerful, and better connected, they shape our lives and—intentionally or not—the Anthropocene era. 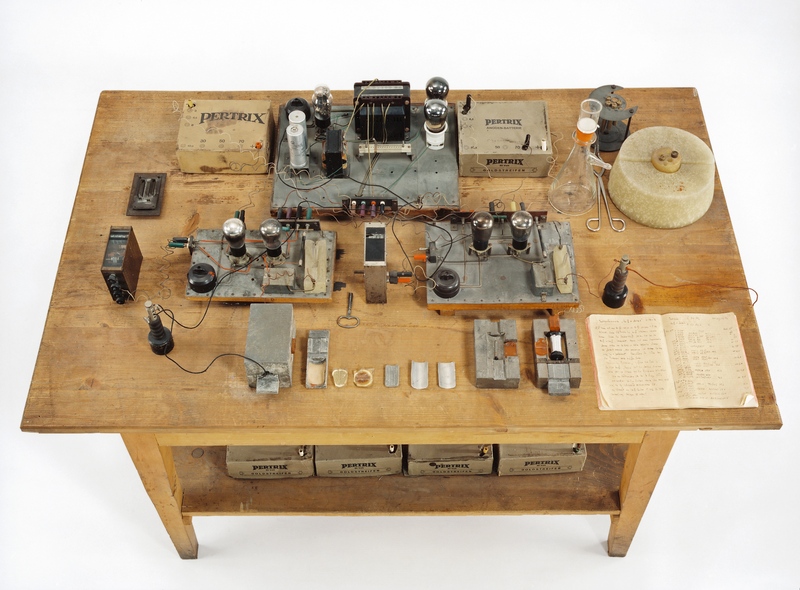 With this experiment Otto Hahn succeeded with nuclear fission in 1938. The Human Brain Project is situated in Lausanne and funded by the European Commission to unravel the complexity of the human mind. Hundreds of scientists from 24 countries are working to model that “magical machine,” the human brain, on a supercomputer in order to gain knowledge of diseases and to develop new computer and robotic technologies. It is still uncertain whether the attempt will be successful, but it will have enormous consequences for both humans and machines. In the 1930s Otto Hahn, Lise Meitner, and Fritz Straßmann at the Kaiser Wilhelm Institute for Chemistry attempted to create “transuranium” elements, atoms with a nucleus heavier than that of uranium. Instead, they discovered nuclear fission, which turned out to be one of the most momentous discoveries for the development of humankind and of the Earth. Many people believed that it would answer all the world’s energy needs: the enormous energy released during nuclear fission seemed to offer a nearly endless source of power that could be harnessed for industrial production, transportation, and domestic use. Created by Jack W. Aeby, July 16, 1945. View source. Attitudes towards nuclear technology underwent an abrupt shift after atomic bombs were developed during World War II and deployed against Japan. In the exhibition at the Deutsches Museum, fragments of rubble from Hiroshima and Nagasaki remind us of these momentous days, which had a determining influence on the Cold War. In the 1950s, Otto Hahn fought against nuclear weapons and bomb tests that contaminated the Earth with radioactivity. But, like many others, he continued to have a positive view of nuclear power. By 1956, the first commercial nuclear power plant was connected to the electrical grid in England, followed by many others around the world. Today, nuclear weapons continue to be a threat to world peace. Nuclear energy is a heavily debated topic, as the risks are weighed against the problems of replacing limited fossil fuel reserves. A safe and permanent way of disposing of radioactive waste has still not been found, 75 years after the discovery of nuclear fission. 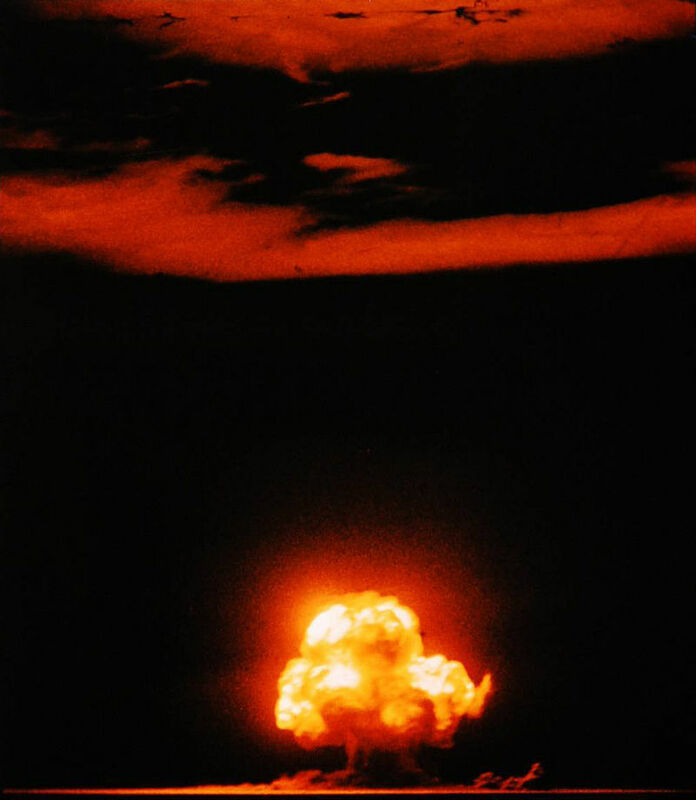 On 16 July 1945, the Trinity test—the first test detonation of a nuclear explosive—took place in New Mexico. Since then, levels of radioactivity have increased substantially all over the world due to the use of nuclear technology. The global, human-caused spread of radionuclides can be demonstrated over the long term and has been proposed as a marker of a new geological period. Thus, the official beginning of the Anthropocene could be set as 16 July 1945, 11:29 GMT—the time of the first nuclear explosion.